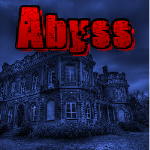 Abyss Escape is a new escape game created by Selfdefiant for Yizzim and Melting-Mindz. You were exploring this strange old place with some friends and got lost. Now it seems that a strange force has you locked inside. Before you lose your mind you should start trying to figure out how to escape this abyss! Good luck and have fun! SD is working late!! Great! are you guys having the problem with the cursor...or is it just me? Been all over the place, found map and crowbar, piano and some symbols clues in M.
Looking for a place to use either the crowbar, or the clue. Have fun guys! I'll attack this in a few hours.It's 2 in the morning so I'm off to bed! I found the clues but not the puzzle. It's in M right? Have not found the screwdriver yet. The flaslight is in one of the cubboards in F.
The screwdriver is in J. For the piano you need to use the number clue on the piece of paper. ah... dident try anything becouse i thought i have to fix it first... thanks. Where did you find the red gem Tijuna? and my coursor isnt working properly ether. sometimes. have anybody found a hint for the number-box in S yet? now im missing some keys to go further... has anybody fount the red or blue key? cursor problem here as well. My click finger hurts. Refresh does not help. SD - can you do something??? Please? Have to run, gotta make a roast mmmmm lol...... goodluck everyone! Where is the book in G? maybe it has some clues for the puzzle underground. @ Cool, please do you remember where is gold key in A, can't find it? so, need purple key. ive found all gems ecsept the green one i think. wher do we use them? Solved puzzel in V ... tricky, combine clues in book. Need purple key too. Flipped 3 levers, but no idea what that did. Have you found any others? no same here. you can flipp the lever in T again but then the gate is closed again.. But the lever in T is the only one you can flip again. Wonder why? I don't find puzzle for clues in M, any hints ? puzzle for clues in m is on the ground in same room, on the right of the chair in front of the bookshelf. Looking all over room X, but can't find that purple key ???? @strawberrie ... I believe it's somewhere on the lower left part of the room. Please ... where exactly is the purple key? I looked ALL over the place, but it's just not there. after mass clicking around X, i finally got the purple key. it's on the left wall between the pillar and the corner, about halfway up the wall. Wondering why one could flip the lever in T.
And why we got the crystal. And out ... thx for all the help .... though I must say my fingers hurt from clicking. @seb: find the blue key and unlock the floor panel. then just click on the panel. Is anyone working on a walkthrough yet? Thanks for your help. Do you remember in wich room where candle for red gem ? Somewhere on the right, in the room with the books, where you found the flashlight. Upper right cupboard. Thanks, I have found the candles but I can't have red gem. I suppose I have miss an hint. Strawberrie, you need to light the candles. I can't remember where the lighter is, I believe in the same toom where you found the screwdriver, but I'm not sure. Strawberry it's trial and error. Light one, of you light the next and the first goes out, try another one after the first one. When bothe stay on then find the next. Thanks for your help, I have now all the gems ! @ Seb: Have you used screwdriver in C, or open box in S ? I'm sorry Seb I can't remember where that came from. thanks strawberry, missed room C! tanks Cool =D got it! Poor you, does it hurt a lot? Left again. Grab the crowbar in between the pipes in the center. Make your way to M. click the books by the 1st and 5th bookshelves as well as the center of the 3rd shelf. Note the number and the symbol. click right of the chair on the ground on the box and input the code. go to E and use the key to get into F.
Click the note on the floor and note the numbers. Use the crowbar on the bottom 2nd cabinet to get flashlight. Go all the way left to A and use the flashlight to get the gold key. Go to N and use the gold key to get into R. Use flashlight to get the silver key. go to L and close in on the piano. Use the number from the note in F for this puzzle by linking up the letter of the alphabet to the number on the note. (1=A, 2=B, ect). Head on over to E and use the silver key to enter I. Grab the lighter on the right window sill. go right and click the right drawer to grab the SD. click on the left drawer. use the SD on the back of the drawer to pry up the bottom and get the red key. click on the poster on lower right of the cabinets. Note the "dial" number. Head back to F and click on the candles on the 2nd shelf on the far right cabinet. You have to light these with the lighter these in the right order. Just use trial and error. Grab the red gem and go to H to open the door to G with the red key. Grab the blue key on the left side under the pew and the book on the right side adjacent to the key. Go up to S and click on the box on the floor. put in the "dial" number and grab the purple gem. Go to J and use the Blue key on the lock on the floor (under the rug). Click on the panel and descend. Head to Q and use the flashlight to grab the knife. Head to T. Use the knife to open the panel and flick the switch. Grab the orange gem and go to Y. Flick the lever down and go left to Q. See that area on the left side between the corner of the wall and the pillar. In the center of that, click and get the purple key. Flick the lever on the right wall down and go to Z. Use the purple key to grab the crystal and flick the lever on the wall down. Go back to T and flick the switch down. Now click on your map and click W to grab the green gem. Go to C (Via map is the quickest way) and use the SD on the panel to get the yellow gem. then it's gem placement time! Travel around and put the gems in their designated spots. Then head to D, click back to view the main door, and click the doors to escape! Best of luck to you then .... hope it will be well soon. got all the gems, but have no clue where to put them... anyone? Just got started. I chose the one with the Orbs (i miss the orb ding). Does the other one without the orbs have the nicer cursor that finds hot spots? I don't like this one where we have to pixel hunt. I don't think so Rachel. Some of us were playing the without orbs version, but seemed to have the same problems. :( Thanx Cool. Wonder if SD planned it that way? If he did, I hope he will not do it again. The games are great, but complicated enough without the pixel hunt. There's a new gotmail game ... does anyone remember the ID to log in? Ah thanks seb ... it's been removed from the front page, because the passwords did not work. But I can log in now. I just started the game and the cursor is a constant pointy finger. I notice others on here with the same thing - is it supposed to be like this or will it be fixed please? I don't know, but for me the game is not playable like this : after many random clicks, I found only a crowbar, I'm not going to hurt my finger in order to find a place to use it. This SD's game is a big disapointment and I'm giving up. Thanks for your reply. I'll wait a while to see if it gets changed - I hate random clicking as well. I also cannot play because of a flickering curser all the time, this is driving me nuts, so i will try again later. I like the new twists, especially the increased reliance on the flashlight, but can also do without the random clicking. Either have the hotspots a little more visible, or return the cursor indication please. unfortunately, i won't be able to finish the game, problem seeking the purple key in room Q. No indication besides Crazed's clue (thanks anyways Crazed :)), and I still can't find it, please SD put the cursor's sensitivity back in. Will try again later. Pointer has really missed in this one ! Was there a hint somewhere for the green gem ??? A very great thanks to Cool !!! Self-defiant thank you for changing the cursor back! I do appreciate your attempt to change up the game to make it more difficult, and I appreciate even more your checking here, seeing what people think and then changing it back. Hello!Where is the blue gem? Thanks @Selfdefiant! It's nice to have a game set somewhere I actually do want to leave. And I'm so glad the cursor was changed before I got to the game! Special thanks @Unknown (for red key), @solitude01 (purple key), and @Cool (green gem). Still don't understand the puzzle in V. Help please. Thanks Premiere You were there before my last post. Thanks everybody. I'm finaly out. Yiyis, look at comment of Cool at 12:30 AM. thx Kees, done. Didnt understand the first time I read it. Many thanks for a green gem ! whats up with the orbs no orbs option? Kinda takes away MM. Just My op. Cool game though, keep em coming! ROFL.....I escape and it wants to know how much of my mind is left???.....lololol!!!!!! Well dang...I suppose this means I must enter the bleak, black ... oh look, one of the purple orbs I missed :P I digress....back to the Abyss to find the answer to the question I already know the answer to @. @ No worries...this time I am armed with my bottle of Patron and a lime, and soon, I will be seen skipping down the hallways and looking fascinated whilst listening to the echo of my voice in the dungeon..lalalalalalala!!!!! TY so much for fixing the cursor hand!!!! It is still enough of a challenge , your games are always entertaining! I was intrigued by the caves....very beautiful! Do they really exist? Thank you SD for another great game. Beautiful! Thank you, Selfdefiant, for another gorgeous dark game. These are my favourite because any success I have in these feels like more of a triumph than the more 'comfortable' beach mansions. Does anyone else get that too? If we were under the threat of being discovered by the beach escape mansions owners it might be the same there, but that would be a completely different type of game, and one which I might avoid playing, haha. Now why DO they call it a humerus when it isn't the slightest bit funny, especially when you injure it? I wish we could have 2 a week like these! I LOVE THEM! Love love love the dark ones. Difficult this one - some things weren't "logical" but I guess that fits the dark theme. Thanks for changing it Selfdefiant. I'll give it a go now. Where do I place the gems...I have all...and what to do with the crysatl? after collecting all 7 gems, go thru all rooms again to find new appeared slots for the gems (usually in a wall). As you have the crystal, you can only click on a room at the map & you'll be instantly teleported there. ok thanks again, now only have 5 gems! got it sneaky 'lil green gem! there's no clue for the candles, just try & error to find out the order. When you get the correct one, the previous candle(s) stay(s) lit. It seems, that this game will get more than 200 posts...! Thank you for this game.... ..